Additional Info: Patient with history of node positive ductal carcinoma of the breast and bilateral ovarian masses. 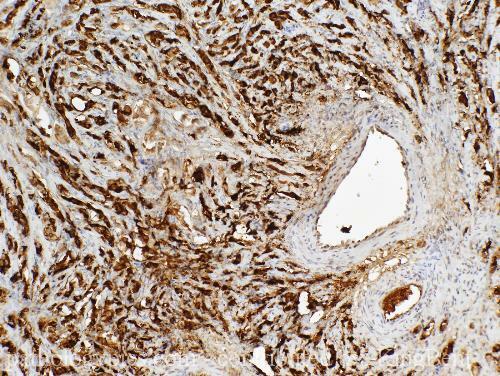 The diffuse replacement of the ovarian stroma by tumor that does not fit any of the usual epithelial ovarian cell types is suggestive of metastasis, as is the bilateral involvement, although neither of these findings is diagnostic for metastasis. The immunostain is for mammaglobin. BRST-2 (GCDFP-15) was also positive.